Jack Bavis, left, and David Dawe, right, came all the way from Newfoundland to wish McKeagan a happy retirement. When chief executive officer Richard McKeagan joined the Mechanical Contractors Association of Canada in 1990, the organization had been through four leaders in the previous four years. He must have done something right over the next 28. 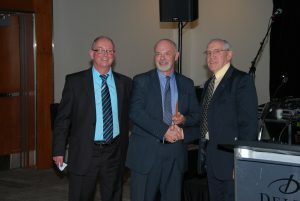 On May 9, 120 industry colleagues honoured McKeagan and his wife Trish at a retirement party at the Delta Ottawa City Centre Hotel. Whalen was just one of many industry leaders that poured accolades on the popular industry association leader over the evening. A graduate of Dalhousie University in 1975 with a Bachelor of Science, McKeagan began his career in the construction industry as a rodman on a survey crew. Prior to joining MCAC, he did a “10-year apprenticeship” with the Construction Association of Nova Scotia, where he became familiar with MCAC through working with the Mechanical Contractors Association of Nova Scotia. Whalen pointed to McKeagan’s work in creating the National Trade Contractors Coalition of Canada (NTCCC) and bringing associations in many different construction industries together to fight for prompt payment legislation. “He did a wonderful job of bringing people into the fold and leading us,” he added. Long-time – and also recently retired – executive director of the Canadian Construction Association Michael Atkinson joined the industry at about the same time as McKeagan and found him easy to work with. Numerous others shared similar stories and sentiments.